Intimate and Distant: Liss Fain Dance's "The Water is Clear and Still"
I love seeing dance up close. So close you can see and hear each breath. So close you see individual beads of sweat. I love to see muscles twitching and engaging. From a distance—from a seat in a large auditorium, watching dancers on a traditional proscenium stage—I know the dancers are breathing and sweating and that their muscles are twitching. But there's something different about being so close you can almost experience each of those things alongside the dancers. This past Thursday, I attended a performance by Liss Fain Dance, a San Francisco–based company visiting Brooklyn for two showings of its hour-long piece "The Water is Clear and Still." 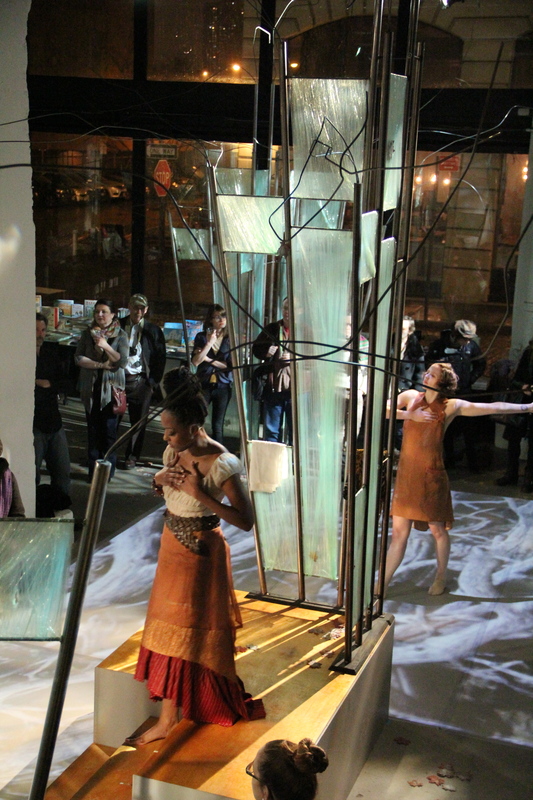 The show was held in DUMBO's powerHouse Arena, a bookstore, gallery, and performance space. 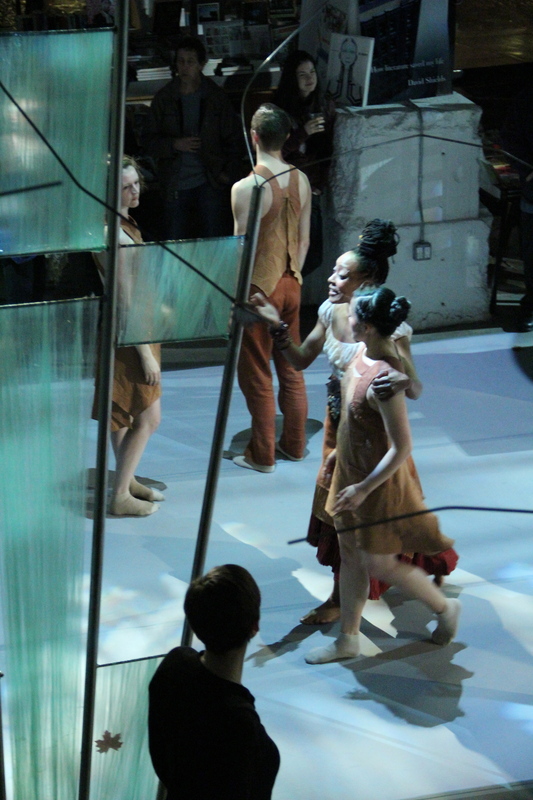 I didn't know anything about the company going in, but I was intrigued by the unusual setting, and by the fact that the audience was encouraged to wander between the piece's sculpture installations, around the perimeter of the dance space, to see the dancers from different angles and vantage points. In terms of visual interest, "The Water is Clear and Still" didn't disappoint. Because I was standing on the same level as the dancers, rather than sitting and watching them from afar, the piece felt incredibly intimate. Yes, the six dancers and one actor who made up the cast occupied a defined performance space, but I could travel with them around the room. I chose who and what I wanted to see in any given moment. And my perspective in viewing the choreography was constantly shifting. I had dancers moving in my immediate foreground, close enough to touch. Through their stretching limbs and suspended shapes, I could see other dancers moving; audience members on the other side of the room experienced the opposite. In one dizzying and effective moment, the lighting design on the floor began to move—and because I was standing there, too, I suddenly felt like part of the piece. Not once during the evening did I find myself without something arresting to see. "The Water is Clear and Still" was inspired by a short story collection by Jamaica Kincaid, At the Bottom of the River. Throughout the piece, an actress circled the space, reciting fragments from Kincaid's stories. She was as much a part of the sound score as the music, and I have to confess that there were times when I heard her voice as nothing more than that: sound, rather than words. Because the movement was abstract and didn't directly relate to what was being spoken, it was hard to focus on both. Aside from a section set to Kincaid's "Girl," in which the actress interacted with and manipulated the dancers directly, I heard individual images rather than a clear through-line. Was this frustrating? A little, and probably mostly because I'm a writer. I would have loved to have seen even more connection between the text and the choreography. Director/choreographer Liss Fain is lucky to have a group of incredibly talented performers at her disposal. Each dancer's technical ability and strong focus worked well not only for the challenging contemporary choreography Fain created, but also for the overall dreamlike aesthetic of the piece. While I wouldn't say I came away from the evening with a clear sense of what differentiates Fain's movement from other technique-driven contemporary dance companies out there, certain movement motifs in this piece did stick with me. Dancers pounding their breasts in unison. Pulling their arms apart, as if drawing back a bow. Promenading slowly in back attitude, wrists circling. The performers were powerful, present movers. Shannon Kurashige in particular kept catching my eye with her precision and control. She danced with complete confidence and wasn't afraid to let go and move with abandon.